No matter what kind of motorcycle vehicle you ride, it transmits every throttle, steering, and braking input to the ground through rubber hoops filled with air, and the relatively tiny contact patches they roll on. That’s a big job for your tires to take on, and they do a damn good job of it – as long as you do your job and keep them inflated with the right amount of air. Unfortunately, as simple as it is to do, it’s something most riders neglect! Your tire pressure has a huge effect on the handling characteristics of your motorcycle and is actually the most easily adjusted variable on the entire thing – so you really have no excuse to not stay on top of it. Let’s explain why keeping the optimal amount of air in your tires is so important and give you a few tips on how to get it right. How Much Pressure Should I Run Anyway? This is a question with a simple answer, but one most riders actually get all wrong! The common misconception is that tires should be run at the pressure stamped on the sidewall, but this is totally incorrect. The correct tire pressure should be found in the owner’s manual of your bike, and this is why: tire manufacturers crank out millions of tires without knowing what kind of motorcycle they’ll be installed on, so they necessarily can’t tell you what pressure you should be running. 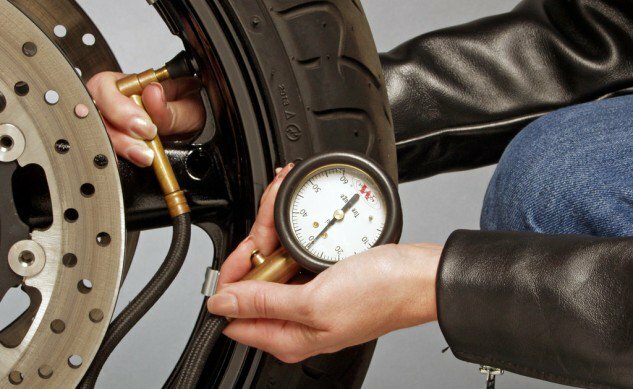 The manufacturer of your motorcycle understands it’s characteristics and the kind of demands it will be placing on the rubber it’s riding on, so they are the ones who determine what the proper tire pressure should be. What about those “Max PSI” numbers stamped on the sidewall of your tire then? Those have to do with the load index of the tire itself – basically stating what is the most pressure that tire is built to handle. The tire manufacturer doesn’t know if the tire will be installed on a S1000R, S1000RR, or a S1000XR , so “correct” tire pressure for your bike isn’t their job to determine. Once you’ve checked your owner’s manual and know where your tire pressure should be, the next step is to stay on top of it. Tires naturally lose air over time (the rule of thumb is about 1 psi per month) so they need to be topped off regularly anyway – but a leaky valve stem, a bent rim, or debris caught in the valve core can accelerate that without you noticing. We recommend to make it a habit to check your tire pressure once a week and top off as necessary. If you don’t ride regularly, at least check it before every ride, to make sure you’re not riding on underinflated tires unknowingly. Underinflated tires pose a big problem and can be extremely dangerous, because they create a whole list of potential hazards, such as poor handling, loss of fuel economy, poor braking performance, excess heat, and uneven tire wear. Over inflation is more uncomfortable than hazardous, as it minimizes your contact patch and makes your ride feel much harsher – but while both are bad, underinflation is worse. Unfortunately, it’s also the much more common scenario. So how do you stay on top of it? As we mentioned, check it regularly, but use a very high-quality gauge, and preferably the same one each time to ensure an accurate reading. You can pump air at the gas station, but don’t use the gauges there – they take a lot of abuse and are rarely calibrated correctly, and just being off by a few PSI can dramatically alter your ride and more importantly create an unsafe ride. Use your own tire gauge, and get a high-quality, accurate one – it will last forever, and can be used on all your vehicles. In addition, it is very important to make sure you are checking your tire pressure when “cold” (meaning they haven’t been ridden on in at least 1 hour.) The reason for this is that heat generated by friction with the road increases tire pressure, so a tire that’s been ridden on recently will likely give a reading that is actually several PSI higher than the “true” pressure. Is There Really a “Right” Tire Pressure? When it comes to the “right” pressure, is the number in your owner’s manual really the last word? Technically yes but it can vary, because tire pressure is something that can be adjusted to changing riding conditions. Adventure riders will be very familiar with the idea of dropping the PSI a few pounds when riding in dirt or on loose gravel. Dropping a few psi will softens the tire a bit, expanding the contact patch and giving better grip. It is important to remember to re-inflate to the manufacturers specifications once back on road. On the other hand, riding with a heavy load necessitates a bump up in tire pressure. Often owner’s manuals will have differing tire pressure specifications for extra passengers or luggage. Consider the difference between a touring bike with no luggage and a single, lightweight rider, versus the exact same bike with fully loaded saddlebags and a top case, a hefty rider, and an equally hefty passenger. The difference in load between the two can end up being a few hundred pounds. In this situation, it is proper to adjust your motorcycle’s suspension to accommodate the heavier load safely. But here’s the clincher: your tires are part of your suspension. Just as you adjust preload in your shocks and forks to handle a heavy load, you should also be stiffening up those tires by cranking up the PSI a few pounds. You must also be conscious about not overloading your tires, which can cause tire failure (which can be catastrophic on a motorcycle.) Consider this – even if you know the weight of everything your bike is carrying, and know it’s under the weight limit, what you may not have accounted for is the fact that for every one PSI a tire is underinflated, it’s carrying capacity drops by around 20 pounds per tire. This means it’s easy to actually overload a bike if you don’t keep an eye on your tire pressure – and people do this all the time! Get the “right” tire pressure for your bike from the owner’s manual – not from the tire itself! Check your tire pressure once a week or, if you ride infrequently, before every ride. Use your own high-quality tire pressure gauge, and use the same one each time, and do it when your tires are cold. Don’t be afraid to adjust your tire pressure up or down by a few PSI to adapt to riding conditions and accommodate a load on your bike. It’s the easiest variable on your bike, so play with it a little – you can always go back if you don’t like the results. It’s just air!